The Standardized Touchscreen Assessment of Cognition was developed by an occupational therapist and a speech language pathologist, both active in cognitive rehabilitation, who wanted to get the most out of their time with patients. By replacing traditional, paper-based assessment tools, clinicians gain precious time and eliminate unintended bias and human error. The STAC maximizes the clinicians' ability to quickly obtain information about a person's cognitive functioning while increasing productive time. Improves clinician efficiency — Patients can complete the cognitive assessment on their own or with the help of a lower-level care professional, giving therapists extra time to treat patients. Comprehensive screening —The STAC assesses attention, memory, sequencing, visual scanning and attention, executive function, processing speed and components of language. Measures accuracy and speed of processing - The assessment times performance and and provides ranked scores based on accuracy and overall speed. No training required - There is no training needed to administer the assessment. Simply follow the onscreen instructions and start immediately. A complete set of instructions are included in the application for review. Easy to use —The user-friendly interface and simple instructions makes it easy for even those who aren't familiar with computers or touchscreen tablets. We designed the assessment to be easy to use for clinicians and patients. Data accuracy and integrity —STAC automatically produces a PDF-formatted score sheet, eliminating human error and saving time. Both qualitative and quantitative measures are provided. Consistency of test administration - Automated delivery reduces administrator error, and eliminates unintended bias. 2 Test Versions in one App - We developed 2 versions to allow clinicians the ability to administer the assessment twice in a short period of time without having to worry about practice effect impacting test results. Affordable —STAC's introductory price is significantly more affordable than standard paper assessments. STAC produces a 4 page report for each user. The report generates raw scores for each subtest and delineates each individual's responses. Elapsed time for each subtest completion is calculated and recorded. For most subtests, the raw score is compared against the user's normative segment to calculate a percentile. This calculation assumes normal distribution. Mathematically, as the number in the normative groups increase, the strength of the percentile score becomes more reliable. Timed score and accuracy are combined together on some subtests to calculate percentile. Combining these metrics allow clinicians to better assess speed of processing. Normative data is carefully collected, and managed outside of the commercialized version. Data collected on 190 people with no history of any cognitive impairment. Segments divided by age and gender. We have developed STAC such that we can continually feed the normative data without having to update the App through Apple. Each time the assessment begins, the most recent normative data is used to calculate percentile scores. STAC was developed by an occupational therapist and a speech language pathologist for their colleagues who are active in the cognitive rehabilitation process. 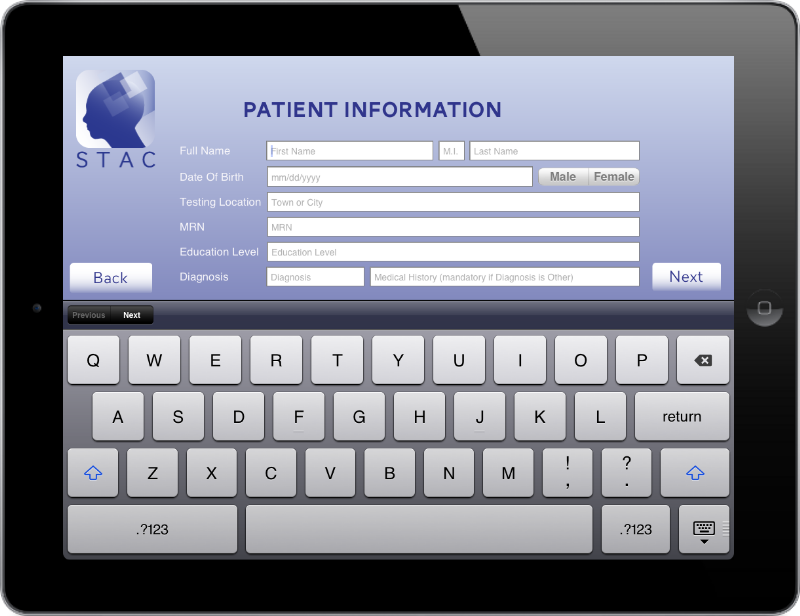 STAC can also be used by physicians, psychologists, and other health care professionals who need to assess a person's cognitive status as efficiently as possible. What functions does STAC assess? STAC assesses attention, memory, sequencing, visual scanning and attention, executive function, processing speed and components of language. Timed tests provide quantitative assessment of processing speed. In some sub-tests, time and accuracy are combined to produce a single ranked score. The individual's approach to task execution can reveal further qualitative information about planning and organizational skills. What system requirements is needed to use STAC? STAC operates on a generation 2 and higher, 10 inch iPad. We chose the iPad for 2 reasons. First the iPad is an industry standard in healthcare. They are more prevalent in hospital/clinic settings. Secondly, when beta testing an assessment app, it was vital that we knew exactly how it performed. On the Android platform we would have had to test STAC on many devices, which just wasn't possible. We also chose touchscreen tablets because they really allow the user to engage and interact with the assessment. What kind of environment is recommended for STAC administration? A separate room is recommended so that the patient is not distracted when completing the assessment. Portions of the assessment produce auditory cues, in the absence of visual cues. It is required that clocks, watches, phones, paper and pencil be removed from the testing environment. How do I buy STAC? You can download the STAC from the Apple App Store. Is training required to use STAC? No, STAC was designed by therapists for therapists. Once you hit “Start Training” the application runs itself. The application contains a full set of instructions and a description of each sub-test for clinicians who need to know the specifics of each task. A brief training video provides training to the person taking the assessment prior to the test. What prerequisite skills are needed to take STAC? The user needs to have functional vision and hearing, intact motor in at least one extremity and be able to respond to simple written statements/questions. A brief training and skill check before the assessment begins determines if a user will be able to complete the assessment. The user does not need prior iPad experience. How is STAC different than traditional paper based assessments? STAC assesses many of the same cognitive domains as paper-based assessments. How does STAC pay for itself? STAC saves time allowing clinicians to see more patients or see patients sooner. Because STAC is a self directed tool, the therapist is not required to be present during the assessment. Additionally, immediate generation of the report saves valuable time.